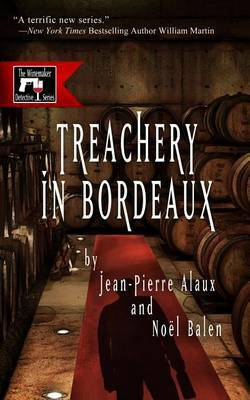 TREACHERY IN BORDEAUX is the first in the Winemaker Detective series, featuring Benjamin Cooker and his new assistant, Virgile Lanssien. Benjamin Cooker is the owner of Cooker & Co and is also the author of a famous guide on wines. Requested, with his huge knowledge of winemaking, to troubleshoot problems, he is asked by his old friend Denis Massepain to the Chateau Haut-Brion and the only vineyard still found within great Bordeaux. There is an infection in the winery, which both Benjamin and Virgile believe has been contaminated on purpose. There is also a side story, which ties in, concerning a decorative panel brought by Cooker. Because the book is so short, whilst there is a lot written about the backgrounds and status of the main characters and the process of producing wine and all the filters and types of barrel and bottles used, there is very little detail on the crime which has occurred and I thought that this was very disappointing. If I wanted to read a huge description of wine making processes I am sure I wouldn't buy a book that indicates it is about crime but then describes in detail the whole wine-making process. I thought that this book would describe Bordeaux, a French region I know, in a more tourist friendly manner similar to the Donna Leon books about Venice. The descriptions of the main characters in what remained of the plot after the wine details are removed was very well handled but as I understand this book is the first of a series I hope that the length is extended and that there is more emphasis on crime and less on wine in future books.